Long, face framing bangs. Fine, glittery tinsel strands throughout for just a touch of evil! 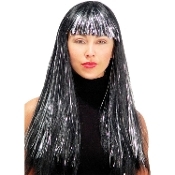 Funky Accessory for any aspiring witch, wizard, vampire, warlock, movie star or pop singing icon costume! •Standard- One size fits most Adults and Teens 14+.